Route 32, unlike the route before it, is a long, trainer-heavy route leading directly south from Violet City and ending at the mouth of Union Cave. Much like Route 3 in Kanto, Route 32 ends with a Pokémon Center near the cave. Poison Barb From Frieda behind the Pokémon Center on Fridays. The fourth route that trainers from New Bark encounter, Route 32 is the first in Johto to see the player's destination to the south– and a far-off one at that. After exiting Violet City through a small path with a Apricorn tree in a clearing, the player comes to a three-way intersection. Either they can head back up north, to Violet City, if they have some business to finish there, west, into the Ruins of Alph, to discover the secrets there, or continue south along the route. After moving south around the large rock, players will find a Cuttable tree on its western side, the path behind which leads them to a man who will give them TM05 Roar. From there, the player should head south, going east or west around the next rock (leading them through tall grass or near a Trainer, respectively). A small bit further south, the route opens up, and players can go along the western side of a small inlet of ocean, facing wild Pokémon and trainers, or cross this on the pier, and come upon three Fishermen. A little southwest of the pier is a patch of grass, where a Great Ball can be found. At this point, players should reach the Pokémon Center, where they can heal their Pokémon from the long journey just in time to enter Union Cave. A man inside the Pokémon Center will also give players an Old Rod. There is a fan of Kurt located in the Pokémon Center that will give away two Lure Balls to anyone. Just to the north of the Center, on Fridays, Frieda will appear to give the player a Poison Barb the first time she's encountered, and a Relax Ribbon all other times. On days other than Friday, a Great Ball can be found where Frieda usually stands. Walking straight south from the Center's entrance, another trainer will be encountered – the last on the route. Directly west of him is the entrance to Union Cave, the first mandatory cave of Johto. The track for the Magnet Train can be seen above near the lake. The northern-most guy on the route will give you a Miracle Seed just for beating Falkner! When equipped, this nifty item powers up your Pokémon's Grass techniques. Come back when you learn Cut to get to the guy south of him on the ledge. He will give you TM 05 (Roar) for your trouble. Talk to the fisherman closest to the healing machine inside the Pokémon Center. He will offer you one of his fishing poles, the Old Rod. With the Old Rod, you can walk up to water and start fishing for Water-type Pokémon. Unlike the Old Rod in Red/Blue/Yellow, this Rod can catch something other than Magikarp (although you will end up catching a lot of those). If you fish here now, you can net a Tentacool, and if you trade numbers with Ralph, he'll give you a call when the Qwilfish swarm. Outside of swarms, these rare fish can only be caught with a Super Rod. Only SoulSilver players can catch an Ekans, but HeartGold players can buy one at the Goldenrod Game Corner. Ekans learns a variety of moves like Wrap, Bite, and Acid, but never gets anything powerful enough to make it worth using. Its token move is Haze (which restores altered stats and conditions)… at level 43. Team Rocket can have this Pokémon, and they're welcome to it. 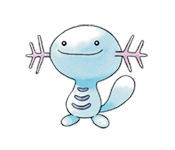 Wooper's odd mix of Ground and Water types grants it limited resistance to Water, Fire, Poison, and Steel attacks, and complete immunity to Electric. Its only weakness is to Grass, which absolutely wrecks it. Wooper has some good moves like Water Gun (at start) and Earthquake (level 31), but generally poor stats. When it evolves into Quagsire at level 20, its stats nearly double, except Speed which drops drastically. You'll definitely want a Mareep, since it's the only Electric Pokémon you'll be able to get for the next several hours. As Electric Pokémon go, it's slow and doesn't learn many Electric attacks, but it evolves quickly and has a great Special Attack. One tip: Never delay evolved form Flaaffy from evolving into Ampharos (its third stage), or you won't be able to learn Thunder Punch. Magikarp can now learn a third attack, Flail, at level 30. Of course, you'd be insane to stick with Magikarp for that long, since it can evolve into a super-strong Gyarados at level 20. Gyarados can now learn Rain Dance, but is basically unchanged. It's probably a good idea to keep Magikarp out of the way for now as you can catch the Red Gyarados later on in the game. Tentacool is pretty much the same as it was in previous games. It now starts with Poison Sting instead of Acid, but doesn't have any new moves. Tentacool and evolved form Tentacruel are still under-appreciated Pokémon that are strong in Speed and Special Attack. Like Tentacool, Qwilfish is a mix of Water and Poison types. Like Tentacool, its best move is a late game Hydro Pump. But it does differ in a few ways: It gets some nice defensive techniques like Minimize and Harden, and has a higher Attack score. It's a good idea to stick with Tentacool instead, however. This page was last edited on 11 May 2014, at 20:33. This page has been accessed 53,238 times.